Learn about Spanish wine and discover traditional Iberian ham houses in Madrid. During this 2.5 hour tour, taste several cuts of Iberian meats like chorizo, salchichon, lomo, and ham paired with manchego cheese and other classic tapas. As you do so, learn about the fascinating history and culture of wine, the differences between each type of ham you can find in the market and master how to shop for them like a local. Meet your guide at the start point and make your way to two different ham houses in the city center that are well-known for having a good selection of national curated meats, cheeses, tapas and wines. Be introduced to Iberian ham and other curated pork meats like chorizo, salchichón and lomo and receive tips regarding their production process. Learn the difference between Jamón Serrano and Jamón Iberico categories within the Iberian ham cuts and the difference between jamón and paletilla. Discover the variety of hams and similar meats and learn where each of them come from. 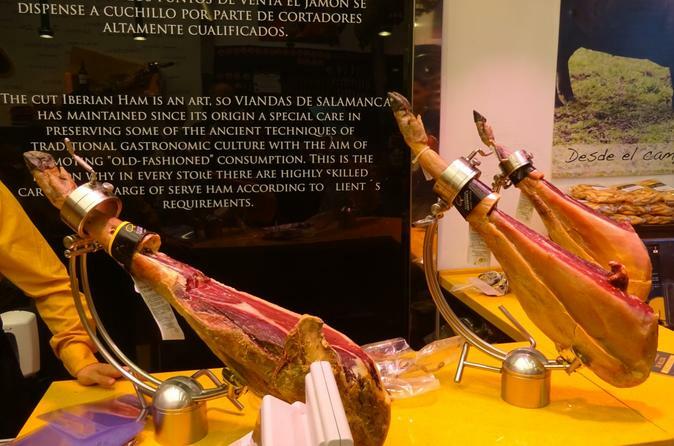 In addition to trying several cured meats and cheeses, you will also see how a professional Iberian ham cutter carves those delicious thin slices with his special long knife. Savor these tapas paired with local wines. If you are visiting Madrid don't miss the opportunity to enjoy this approx. 2.5-hour experience with friends and family.